Good evening, gang. Colder winds continue to blow across the bluegrass state on this Christmas Eve Eve. 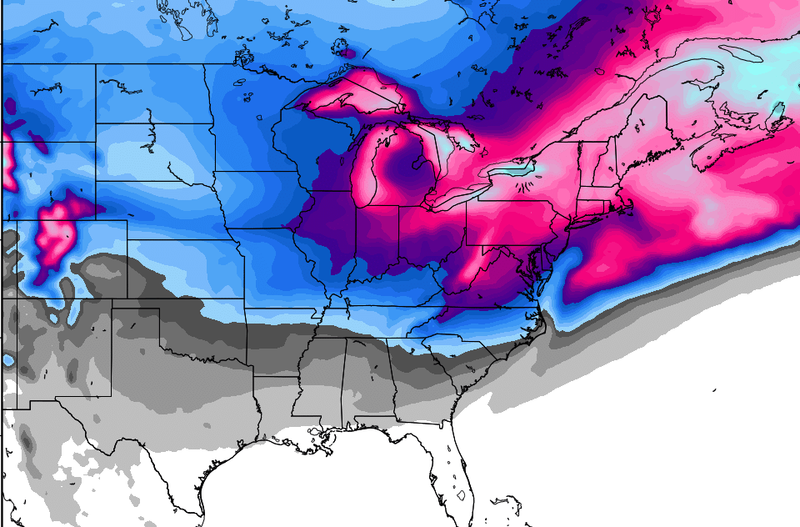 All eyes are on the big Christmas Eve forecast, with a light snowfall ready to accompany Santa into the bluegrass state. I’m not going to spend a ton of time on all this, as we seem to have had everything covered for a while now. 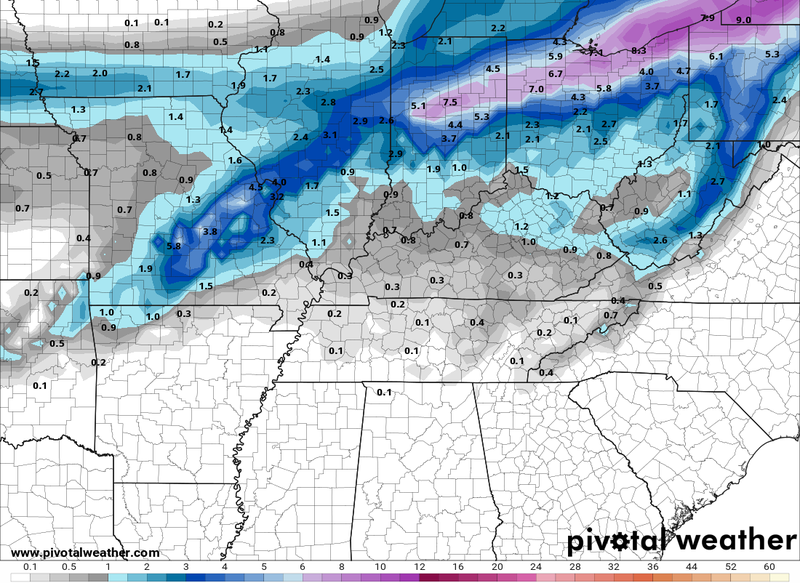 Let’s get a quick review of what the models are forecasting for snowfall. A reminder that the lines are only to be used as a guideline. 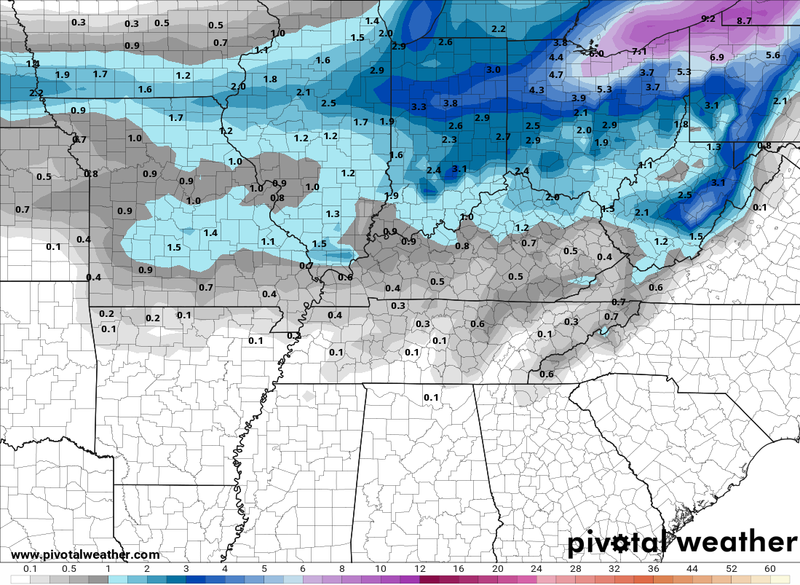 In forecast area, we will likely see some variance in the light snowfall totals. That’s the nature of light events. I will update that call later tonight. Another light snow maker moves in by Tuesday, with additional systems arriving later this week and through the first of the new year. Merry Christmas Eve Eve and take care. Good afternoon, folks. Our heavy rainmaker is pulling away from the region, leaving behind several inches of rain and some flooding issues. As expected, this action is ending as a period of mix or light snow, but the main focus is on the light snow coming for Christmas Eve. 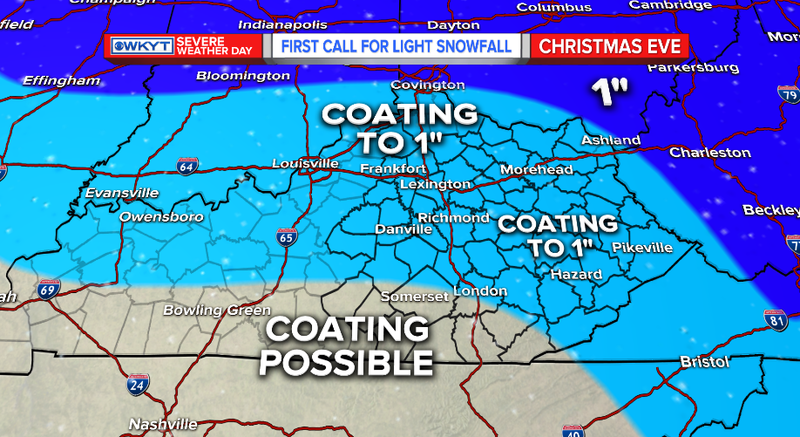 As far as the Christmas Eve light snowfall is concerned, things are still on course for a light snowfall just in time for Santa’s arrival in the bluegrass state. Temps early in the day will spike, especially in the east. 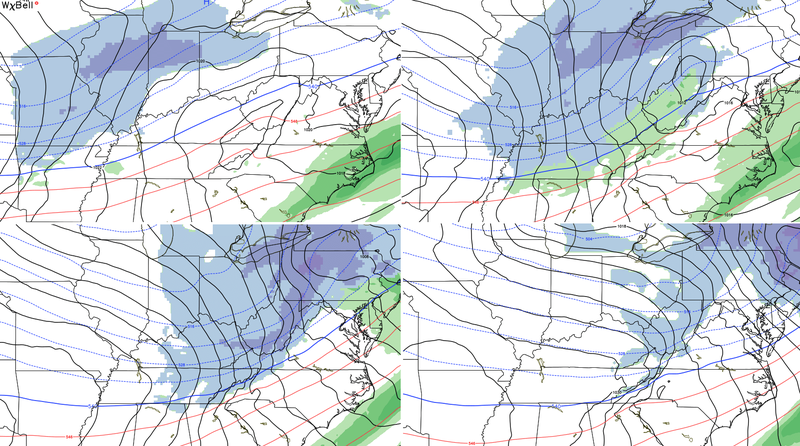 That’s where a mix of rain and snow is likely at the start, before going over quickly to light snow. Winds are going to be very gusty as temps drop below freezing from northwest to southeast. 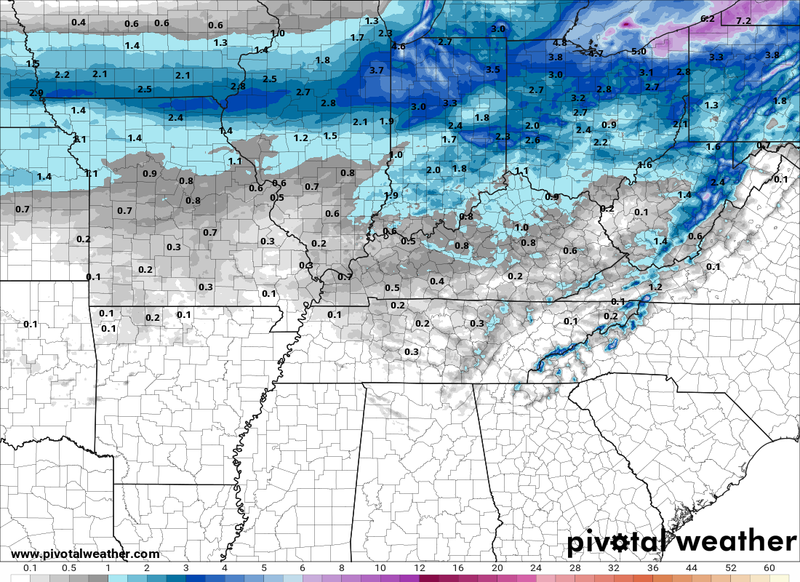 Notice how it takes accumulating light snows all the way into Tennessee. Melting flakes will be likely for many in the afternoon, but that quickly changes as we near sunset. Those melting flakes will create wet roads, that can ice up as temps drop into the 20s. 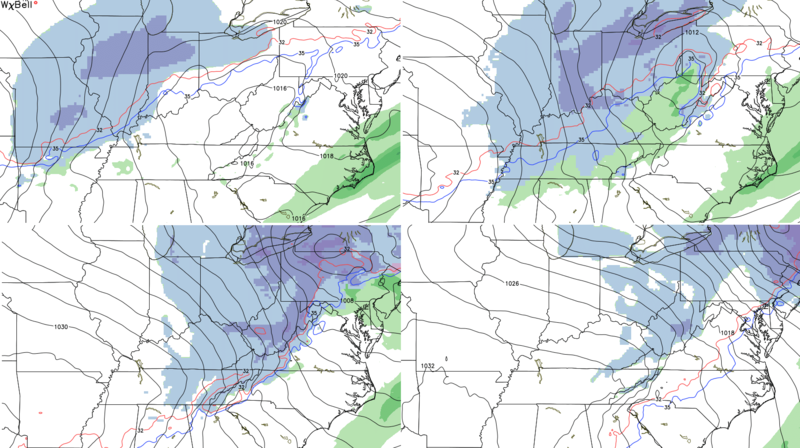 It’s from late afternoon through the wee hours of Christmas morning that we have our best chance for accumulating snows. 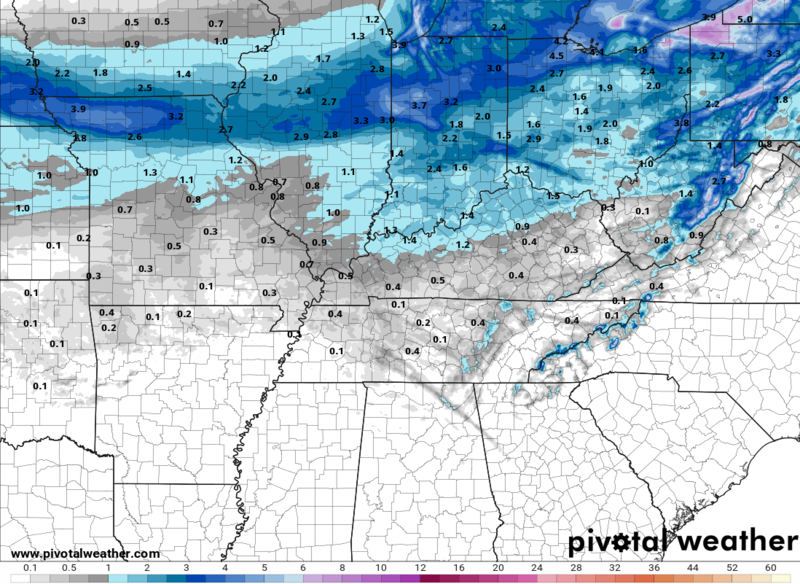 This continues to look like a general coating to 1″ for much of Kentucky, but I’m probably going to add an area of 1″-2″ with my new call for snowfall this evening. I’m increasingly worried we get ourselves into a similar situation to what we did a few weeks ago with snow and ice covered roads. Given all the rain, road crews haven’t been able to pretreat and we will likely see more snow than what we did a few weeks ago. I firmly believe this to be a Winter Weather Advisory type event. It’s not a lot of snow, but it’s a busy travel day with wet roads and rapidly falling temps after dark. Impact should trump some made up criteria every single time. 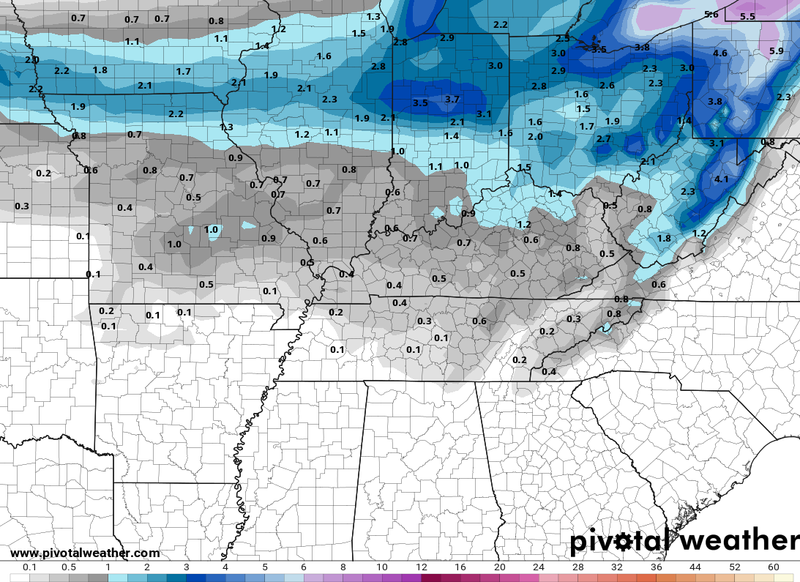 That may also put down some light accumulations. That will be followed up by a much more potent system that may impact our weather as early as late Wednesday or Thursday. This signal has been showing up for a while, and it continues to do so as we get closer. 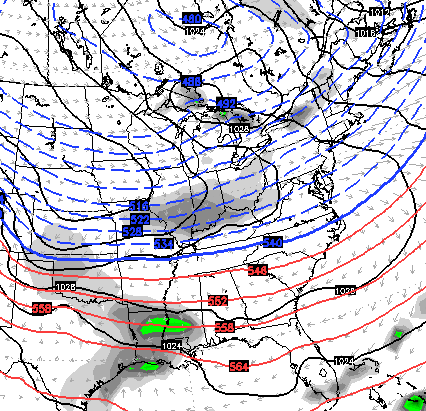 A similar system may follow that up right around New Year’s Eve. 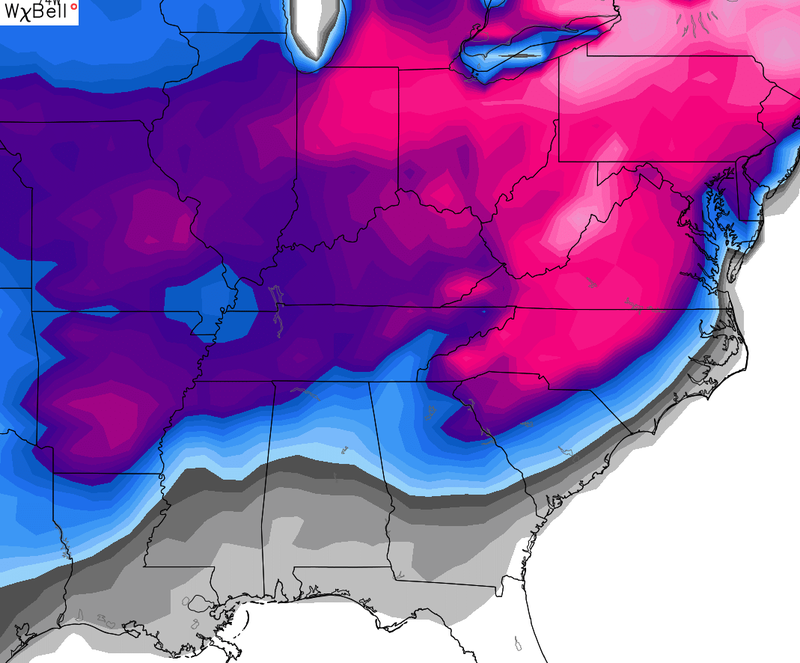 As I said yesterday, we haven’t had a Winter Storm Threat in nearly 2 years. I think that changes soon. I will have another update this evening, so check back. Make it a great day and take care. Good Saturday, everybody. Heavy rainfall continues across the state as we roll through the first half of our Saturday, and this may cause local high water issues. Once the heavy rain ends, the cold air takes control, with light snow waiting for our Christmas Eve. Temps crash from northwest to southeast, and this may produce a bit of a mix in the north and far west. This doesn’t look like a big deal. at the moment. As temps drop below freezing by Sunday morning, watch for some slick spots to develop on area roads. This brings us to our light snow maker for Christmas Eve. 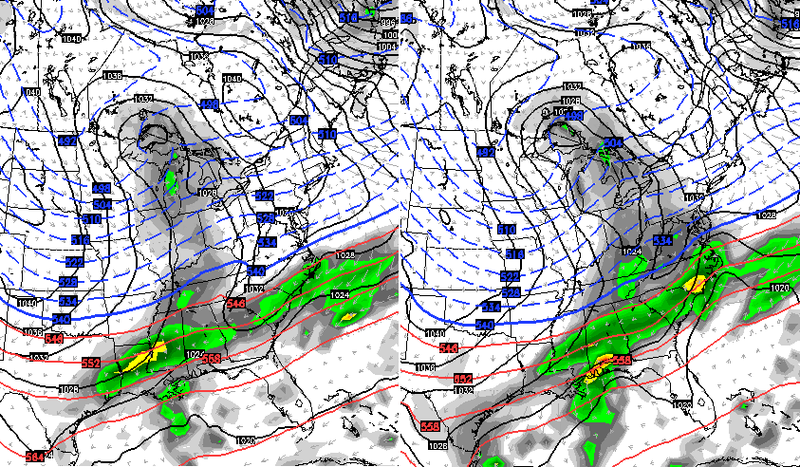 The trend I said to watch for is taking place, with the models trending stronger with our wave of low pressure. 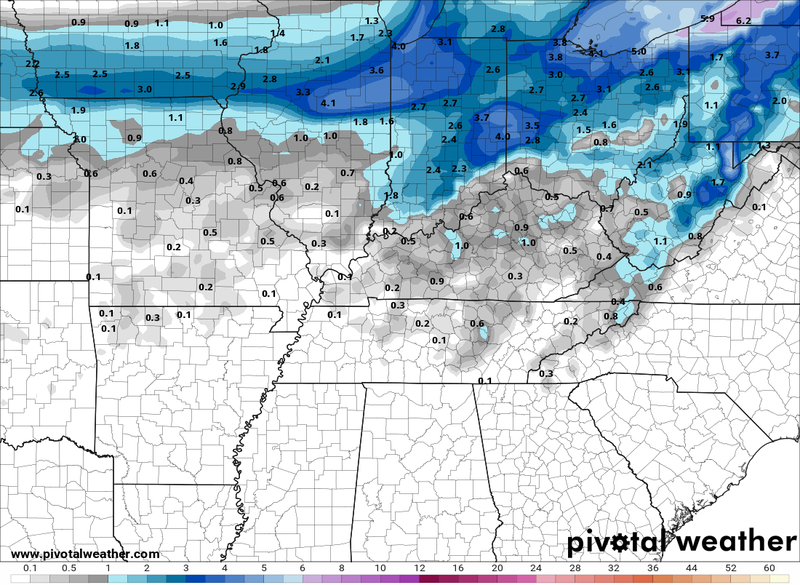 That gives us a much broader swatch of snow to deal with on Christmas eve. Some areas may do a little better than 1″, but I’m not ready to bite on that just yet. I will update the “call” with updates later today. Roads are likely to be wet through the daylight on Sunday, then may ice over after the sun goes down. Road crews won’t be able to pretreat because of all the rain falling today, so we will need to be on guard for slick travel developing Christmas Eve into Christmas morning. Christmas morning flurries will then give way to a partly cloudy sky with a cold wind continuing to blow. That wind may blow a batch of light snow and flurries back into the region Christmas night and Tuesday. 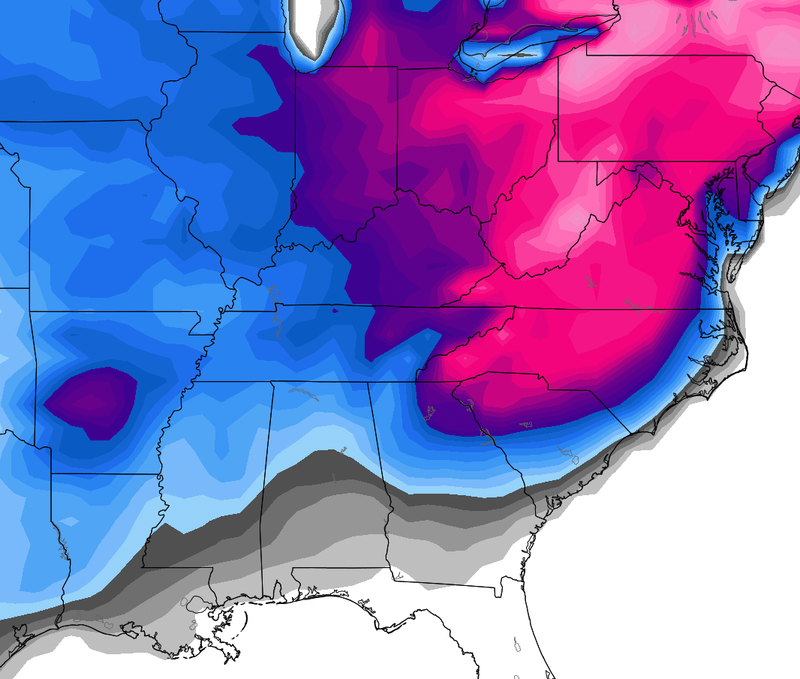 That’s not a system that’s a week or two away, that’s a system we are tracking from less than 5 days out. It’s still only in the “interesting” category, but it’s a healthy signal.